INTERVIEW BETWEEN M.K. DAVIS AND BIGFOOT BOOKS’ STEVEN STREUFERT, CONTINUATION AND... ABRUPT CONCLUSION. NOTE: THIS IS PART TWO OF THE INTERVIEW. View PART ONE HERE first if you have not yet read it. 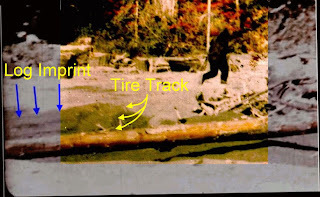 Bigfoot researcher and Patterson-Gimlin Film (PGF) expert, Marlon Keith Davis commented on our recent blog entry on the Port Orford Cedars in the Bluff Creek, CA area, and that contact has led to this interview. It was started November 10th and completed December 18th, 2009. It was done via email exchange. You'll find that the ending is a little abrupt, and I suppose the reasons are obvious. Oh well, despite this, MK has been an absolute gentleman the whole way through. Thanks for that, MK! 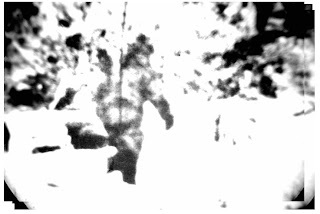 Images, most courtesy of MK Davis, from the Patterson-Gimlin film. To left above, what MK sees as the bangs of Patty; below, the topknot. CLICK TO ENLARGE and view all of these images independently. NEWS: BIGFOOT'S BLOG APPEARED RECENTLY ON BIGFOOT SIGHTINGS.ORG, regarding the first part of our MK Davis Interview and Discussion. Check out this cool Happy Camp-centered blog, written by a very cool lady, Linda Martin. 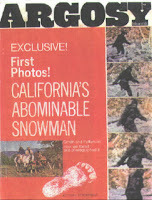 Bobbie Short, of BIGFOOT ENCOUNTERS also included us and a link again in her fine monly newsletter. You MUST sign up for it if you want to be in the know. Thanks you two! NOTE: We are inviting comments and rebuttals to this and the previous MK Interview blog entries. Please feel free to CONTACT US by email, or COMMENT directly below this entry. But please, keep it free of slander and hate speech, OK? We'll perhaps be publishing this in the very near future if the responses are interesting enough. 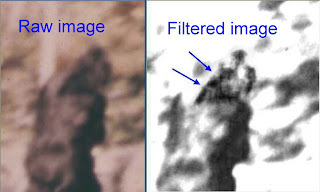 The [...] raw image and enhanced comparison shows the smaller ponytail arrangement. The file called "hair swing filtered" shows the moment that the hair blew away from over the ear, and exposed the ear to the camera. I know that your blog does not support animated files, but in order for your readers to appreciate what I'm talking about, they need to see them in motion. In the file "nohairheadhairaftertree2" [see screen capture] the hair arrangement can be seen. Most of the copies of the film are very low contrast, in other words, levels of color and tone, are difficult to discern, and the lines of demarcation between them are indistinct. The better images, however, allow much more to be seen and determined. There is a rule of thumb, in astro-photography, that applies to this film very well. The rule is: "If you can improve the resolution of an image 1%, then you will likely see ten new things in the image." This has proven to be very true, when working with the Patterson film. When the quality of the raw image is at, or very near the original, then the data that it yields increases exponentially. If the subject has long head hair, as the film seems to indicate, then that is consistent with human, as there are no examples of simians possessing such hair. If that hair is pulled back into an arrangement, no matter how rudimentary, then that is an indication of culture, along with a host of other things as well. The film itself is good enough in its original form, to tell its own story, and does not need to be filtered through the testimony of others. BIGFOOT BOOKS: And the hand print...? MK DAVIS: The hand on the log in the famous frame 352 is very enigmatic indeed. It only becomes apparent as to what it is in the very best images from the film. 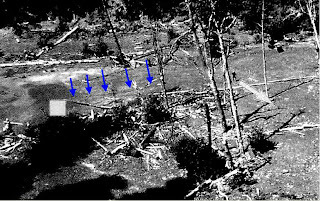 It was this hand that drew my attention to the log in the first place; and when a proper insepection is done to the log and its surroundings, using the very best imagery, then some basic facts begin to emerge that could be used to explain the activity surrounding the log. Images: MK points out these details: the moved log's former depression, next to this the presumed tire tracks. 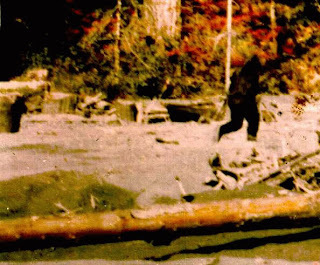 I was puzzled about the presence of this impression and how the log appeared to have been moved, when the log is clearly too large for a human to move by himself, and probably a Sasquatch, too. I decided to look outside the film for some evidence or indication that some equipment had been actively present in the area, that might explain this. I am aware, from my visits to the film site, that this particular type of sand, holds impressions for a very long time. I knew that there were photos taken by later visitors to the area that might prove useful. I found a very good wide angle photo of the area, taken from "above" the filmsite by climbing up the bluffs, overlooking the sand bar. 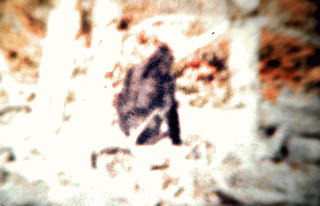 This photo can be referenced in Chris Murphy's "Meet the Sasquatch," by Hancock House. 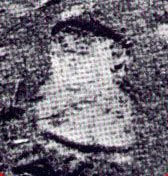 In that aerial photo, taken at quite a later date, is the remains of that very same impression, with its full length being much more apparent from above. Using filtration, I was able to boost the contrast enough to clearly delineate the impression. It meandered across the sand bar in a figure S crook and went straight into the log at exactly where I first noticed it in the Patterson film. Not only was that singular impression noticeable, but there were many more following the exact route, all ending on a rectangular shaped area of much darker sand. Since I was aware that the sand became much darker when it is moist, then this rectangular area was more moist than its surroundings. This was probably due, in my opinion, to different compaction characteristics of sand that has been disturbed. So...here I had, in the Patterson film, a heavy log, with a hand print on it, that had been moved out of place by something leaving a track that was linear, and encompassed the majority of the sand bar as seen from above, and a rectangular area of uncompacted sand. 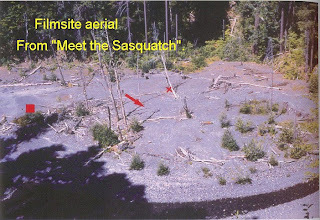 Note: the photo from "Meet the Sasquatch" has a red rectangle on it to denote the position of Patterson. This is not the rectangle that I am referring to. It is the larger rectangle that is naturally on the sand bar. [See the Filmsite images to left.] This was when it first became obvious to me that equipment had been used at the site and from the looks of it, not too long, in time, from the filming. Images: The PGF site as seen from the dirt access road just to the south. The color one was taken in 1971 by Rene Dahinden, so far as we know--Murphy credits it to him. My first impressions, upon discovering the equipment tracks on the sand, were that some logging or mining operation might have been going on there, and that the hand print might actually be related to that activity. I was very surprised when Bob Gimlin told me that there was no way that any equipment could have gotten, or could be gotten, in there to the filmsite. He told me that the only way to get any kind of equipment in there would be to fly it in with a helicopter. This left me with a lot of facts about the filmsite that are unexplained, were that to be true. I was to find out later that this was not the case, and in fact, there were good roads in there, where large trucks and equipment could indeed be brought in to that sand bar at that time. A later examination of transparencies that contained that area in front of the log was to reveal the probable reasons for the hand print itself. 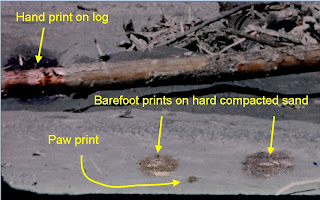 In most of the "copies" of the Patterson film, the sand bar itself has had its details washed out through the copying process, but with the transparencies that were taken from the original film, the subtle tones of the sandbar reveal the slightly divergent tones of a barefoot track in front of the log. There along with the barefoot track is what appears to be a paw print. My feelings right now are that the barefoot prints and the handprint may very well be connected. The hand print is either from a Sasquatch, or a person. If it is from a Sasquatch, it would be significant. 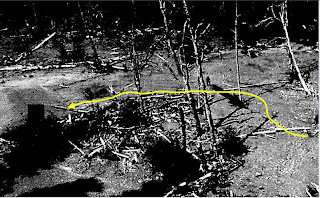 If that turns out to be the case then what we are looking at on the log may be the hand outline of a Sasquatch. Another first for the Patterson film, but with more questions to answer at the same time. If the hand print is [from] a person, it is still significant, as to the level of activity that had been going on there preceding the film. Interesting...isn't it? BIGFOOT BOOKS: Well, MK, I'm starting to feel a bit like Dr. Watson here. I can see you're Sherlocking on the trail of something here. Maybe I should just get out of the way and let you lay out the clues and their meanings for us? Or maybe I'd better question a few things...? Let me first just kind of put the "human" issue to rest. I'd say that it is obvious that the Sasquatch is not really quite like us nor the apes. Surely, it is not as close to us as the Neanderthals were. I'm reading a novel now, BROTHER ESAU, about the capture of a Bigfoot-type creature, where one character says, "In a sense this... creature... that you keep... is a man. Or if not a man, a brother." I'd think that this kind of view would come closest to explaining, say, the Native American view of the entity. It is closer to us than the other animals; but then, all the other animals are kindred of a kind, each with a special spiritual force and relation to mankind. In that they are so like us in form and apparent intelligence, and in many ways better adapted, these beings take on a certain special meaning and relation. This, too, would do a lot to explain the mystery of the appeal of the Bigfoot to today's modern-cultured people. Re. the topknot and all of that: I'm not too convinced yet. I see what you're talking about, but it seems to me that these things are just too fleeting and vague down below the true resolution of the film to be exactly determined. I'd think a braid and styled bangs would be more obvious throughout the film, too, not just in those few frames we've looked at here. And besides, even if those were aesthetic grooming, it would not prove that they are exactly human--there are many animals that show incredible ingenuity and creativity, even if it is instinctual. Think of the bower birds, for instance. 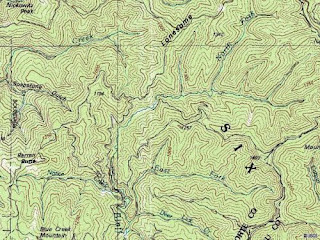 Images: above, US Forest Service map of the Bluff Creek and Lonesome Ridge area, film site right near the middle; below, the author of this blog investigates Bluff Creek just past the PGF site, photo gratefully borrowed from Mike Esordi--read the Believe It Tour blog.. In what you've said about the film site, I would agree about the roads. There were indeed logging roads, bulldozed dirt things, but accessible to a tractor at least, and one in particular right along the south and east bank of Bluff Creek. Parts of this old road are still slightly apparent even now right downstream from the film site. I don't know why Bob Gimlin would have said that to you, as I would swear he's mentioned the roads in interviews before on more than one occasion. Perhaps that was just his memory of the site? I'd doubt he'd lie about something like that. One can even see him riding with the horses up that road on the Patterson film reel, in brief scenic shots they took that day just before they saw the creature and filmed it. 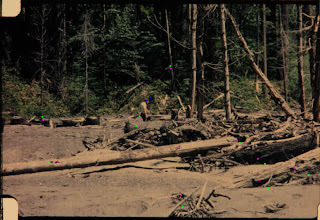 There were active logging and access road construction areas throughout the Bluff Creek area back then--one can even see the sawed off stumps of logged trees in the PGF, right behind Patty. I'm not sure what the issue is, though. MK, can you tell us? It does seem clear from what you show that the film's famous frontal log was moved. But why? What if it was moved by whomever it was who was sawing trees to make those stumps you see in the background, and then hauling the logs away? I've been on the film site many times. Even to this day there are damp areas and boggy little ponds up on the sand bar where the creek water and springs have caused saturation. That is exactly what those dark areas of gravel/sand appear to me to be. What are you thinking they are? And if that seeming hand print and foot and paw prints are what they seem, how can we presume they are connected in any way with the film of a Bigfoot? What does it mean, MK? Also, that rectangle you speak of is readily visible in the film site photos taken a few years later, but is it there in the original P-G Film itself? Interesting? YES, you bet! Looking at the film this close-up is just amazing. Would that the whole world could have access to the highest quality version of this film! It would make such a huge difference in convincing people, wouldn't it? Not everyone has as much access to MK Davis' version as they do to The Discovery or History Channels or whatever. 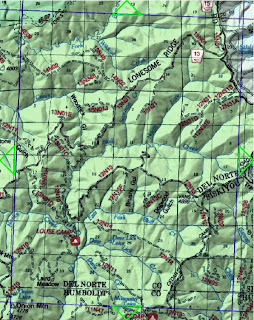 Image: USGS Lonesome Ridge map, containing Bluff Creek. The PGF site is in grid 10, just below the long North-South line of creek below the word "BLUFF." CLICK TO ENLARGE. MK DAVIS: I'd like to address the resolution issues here if I may. As you can see in some of the transparency images that I sent you, the resolution of those particular images are splendid and are far greater than most of what anyone has seen in the public copies of the film. This has been one of the conundrums that has puzzled me for a long time, i.e. why is there so much disparity in the quality of the many images from the film?. These transparencies are "flat field" images, and are sharp, "edge to edge". This means that it is highly unlikely that these images were created with a Kodak K-100 equipped with a 25mm lens. "Flat field" lenses are designed to be used in portrait photography, or landscape photography. Whatever camera took this, had a different lens than what we have been told that Patterson was using. 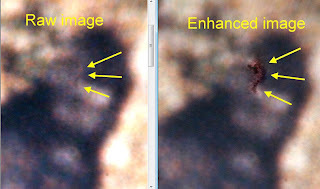 Here is what Bruce Bonney had to say about the prints that he made from these transparencies: " The maximum limit of anatomical resolution in the three sharpest cibachrome prints, is about one centimeter, meaning that details of the creature's body larger than one square centimeter in area are visible in the prints and are capable of basic identification. Items as small as a marble or grape can be identified". I am in agreement with Mr. Bonney's assesment. The popular paper that was circulating for a number of years dealing with the film resolution, was based upon errant information supplied to Kodak, and does not represent the film, especially the transparencies. Resolution that is smaller than a marble or grape, should and does include extended features such at that of the hair. The major impediment to anlysis in this film is getting images from the original film. With the original film, there are more contrast issues than actual angular resolution issues. There are also lensing defects that can be largely corrected, which I have painstakingly done, such as correcting the chromatic abberration in the images, by using filtration to remove unfocused colors. The ear is completely obscured by hair, until, for a few brief seconds, the wind blows the hair out from over the ear. The hair is long enough to cover the ear. In the frames that have good detail of the ear, the hair can be seen to be resting over the ear and onto the cheek. It is terminated in a linear tip that is linear for about three to four inches. This is certainly a larger object than a marble or a grape. It is either a braid, or a dread lock, in my opinion. There are no examples of simians with long enough hair to cover the ear and blow in the wind in the manner seen in the film. Could this be a human from long ago? Patterson was of the opinion that it was. I'm only going by what is on the film. I see no simian anywhere in the film. Images: More from MK's enhancements, above. Below, screen captures from an animation displaying a hair lock. CLICK TO ENLARGE. MK DAVIS... CONTINUES (after a break of some days): While the film itself is of good enough quality to vouch for its own self, the story behind the filming lacks much to be desired. When I say, much to be desired, I mean that it is not backed up by the film or the known facts about the film. The famous timeline for getting the film developed, and how it was impossible to get it done in that amount of time, has been well documented, but there are other pertinent things as well. When these things are taken into account, I believe that it may be possible that there may indeed be an attempt at rewriting history here about the film. It is clear that the film is a documentary film and not a hoax or a piece of fiction. The principles involved in the production of such an important piece of documentation, do not reserve the right to change it or explain it in such a way as to compromise its integrity. The bad versions of the film, along with inadequate explanations of it, have sent many down a long, unfruitful road, paved with disinformation, and that mostly doubles back upon itself. The film, in its most pristine form, is a film of enlightenment, that pokes and prods at latent memories in all of us, and for such a brief moment, we are connected with the past. It is a film for the ages. Some have said that I have put myself out on a limb, by taking on this project, but I beg to differ. I am not out on a limb as some suppose, but rather... I am out on Frazer's Golden Bough. 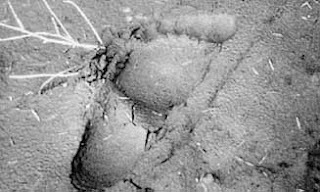 BIGFOOT BOOKS: I'd asked you about the footprints, handprints, etc....? Love the Golden Bough reference! More on that later. MK DAVIS: The hand print is enigmatic at best, but there are some things that can be determined about it. 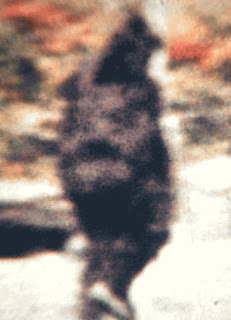 Presumably, it is not Patterson's nor Gimlin's as they were approaching as he was filming, as the story goes. It is inconceivable to me that this hand print went unnoticed by the two men, as it is in plain sight, and it is not small. The area on the log, under the fingertips of the print, has been smeared in an arc. This would require a "twisting" motion of the hand, with pressure on the fingertips. What I see here is a very short visit by the owner of the hand, who twisted the hand when the subject continued by and the hand still on the log. The final move was a shove off. 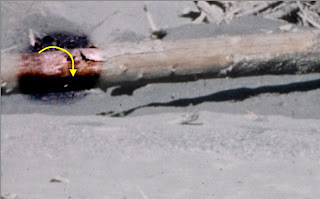 At that point, the entire length of the fingers made contact and printed on the log what we see there. The medium for the print could have been sand, but after studying it, I now think not. I know that there was moisture involved to make it stick so well to the log. What I see here is a powdery medium that is highly reflective and pasty when moistened. I was puzzled by this, and decided to go back to the film to see if I could find any evidence of anything there that might have comprised this media. It was in the aerial photo that I found what I think might be the source for the media in the hand print. 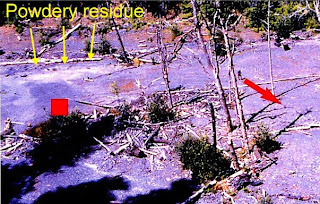 On the upper end of the rectangle of uncompacted and disturbed sand is the remains or residue of a white substance that remained even after quite a long time. The photo being taken from the high place above the filmstite makes the residue even more conspicuous. BIGFOOT BOOKS: But what IS this powder, if not just drier or differently grained sand? And what is the meaning of a handprint, if it is not just a coincidentally shaped residue of river wash sand/mud or bark remains? MK DAVIS: I think that the print is genuinely that of a hand. Who was present, that had hands? Two men and a Sasquatch for sure. Is the media of the print from those white spots? I can't say for sure, but it is a possibility. It is close by the print location. The film will give me no more information on it. I have to move on. BIGFOOT BOOKS: Yes, I do agree that the film can only say and show so much. 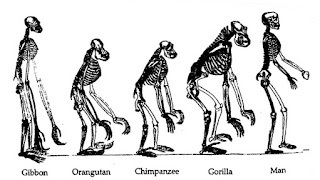 What you point out in it, though, is a lot more than the usual ape-man or man-in-a-suit approach. Where, to what points, are you "moving on" from there, as you say? What other information IS there? I'll address the timeline later, after you've finished making your full case. And have you noted the recent work of Bill Munns on the P-G Film? MK DAVIS: We (humans) are the drivers of this planet. We are in the drivers seat. We have spread out and over this planet like no other species, but often times, we are guilty of speeding. We drive by too fast to see where we are in relation to the other species that share the planet with us. Perhaps there are other members of the human family that have yet to join us in our fast car. They won't get on... and we won't slow down. So...we don't see anything but an occasional glimpse, or perhaps a blurry photo of a people that seem to be more akin to the animals than us, wearing nothing but the night sky around their shoulders. A second look, and they are gone. They're not going to go with us. They have bought a ticket to nowhere. When I look at the Patterson film, no matter how many times that I have, I look at it with ambivalence. I wonder..." where is she going?" Do I really want to know? BIGFOOT BOOKS: MK, were you continuing with your answer to this part, or are you done? Your answer is intriguing, for sure, and I want to address it further; but it left some of my previous questions unanswered. 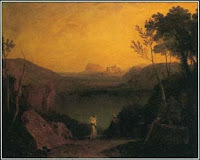 Images: from Wikipedia and public domain. MK DAVIS: I've been burning the midnight oil lately, standing in for other fellow employees who have taken off for the holidays. I'll get a break soon and resume. BIGFOOT BOOKS: OK, I will just respond to what you've said previously without adding a bunch of new questions, and you can answer my questions along the lines you were heading. I hope you don't mind if I push things a bit here? Anyway, perhaps it is time to lay some cards on the table? If this is just stuff you won't talk about at the moment, fine; but maybe you could tie up some of these loose ends for the readers? I mean, you're getting at things here, hinting, but not quite explaining them. What is the reader of this interview to make of handprints, strange powder, rectangles on the film site, etc.? Your human-Bigfoot theories are much more clear. From those I get a lot of sense, and you've moved me more in that direction than I was before (though I still feel they are a different species, just like coyotes differ from wolves). But so far this latest stuff cries out for an explanation. The sense of mystery you get from the film is palpable. I believe you are sincere. 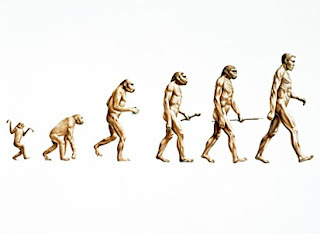 The Golden Bough of earlier humanity you speak of rings poetically, connecting us perhaps more closely to the Sasquatch and our own natural human evolutionary past, taking us away temporarily from the cultural fixations of our current human predicament. But what of these other things? When you and I spoke for about three hours on the phone, back in June 2009, you were quite open about your theories, sending me a lot of photos and animations, and you mentioned a bunch of bloody, gory things that perhaps now you'd rather not get into. But I heard you the other night being interviewed on an online BlogTalk Radio show (Bigfoot Busters, click HERE), and you kept saying that you "couldn't get into those things right now." This seems a drastic change to me--what happened in the interim time? You spoke also of working with others on this theory and research. Who are these folks? Jim Lansdale? Dave Paulides? What is this research about, where is it heading, and why? Regarding things seen in the film: I'm just not sure at all, in my humble opinion, that the film tells that much of a story beyond the creature in it. Granted, you have better images than I can see on my TV videos and YouTube. But, it seems to me that you are adding a bunch of stuff up that may not even be related. I mean, a handprint, which may not even really be a handprint, one dog pawprint without any others around it, things that look like humanoid footprints but may be months old, moved logs, one tire track without any others around, a pool and wet sand at the start of the film that just look like normal creekside stuff to me--these don't really necessarily fit together, to my mind. 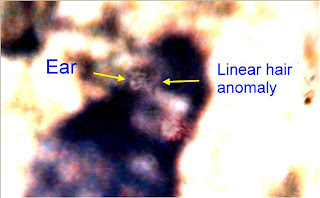 It is like a bunch of dots on a page--you can connect them in any way you like, but that doesn't mean that the "picture" they make is a real one. What I do feel needs to be addressed here, even if you don't want to get into the larger theory, is the issue of the film's making and timeline. You spoke on the radio show of it, and said that others knew the details better than you. Well, I am not the expert as, say, Daniel Perez is, but I can say that there seem to be a few wrong assumptions you're holding on to. Perhaps we could delve into that a bit more? And what of that other film you were talking about back in June, showing Green and others in the Bluff Creek area with the white Alsatian tracking dog? From all that we know in the recorded history of this period, August to October of 1967, it seems pretty clear what--basically--happened. Granted, there are discrepancies in the tellings, things that seem to contradict. But I'd first adhere to parsimony in viewing these. Remember, even a book like the Bible is fraught with self-contradiction; but that doesn't mean that what it is talking about is a lie, or isn't basically true. One needs to approach the text, as it were, try to see through to what is really in there. Using Occam's Razor we can try to see the simplest things first, and try to see if they make sense that way. 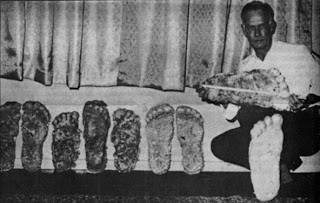 Later retellings, still going on to this day in seemingly EVERY book on Bigfoot that comes out, only seem to complicate the issues, as do most new theories. What if it is just as simple as Gimlin tells it in his 1992 interview with John Green? 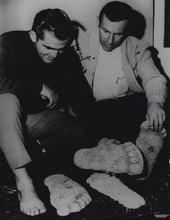 * They filmed it around 1:30, or a bit earlier, tracked the creature a bit, made and removed track casts, etc. * Left the Louse Camp area around 3:30 or 4:00. * Assuming two hours from film site to town (Willow Creek!) this makes sense. * "Mailed" it means sending it--in this case it had to be by plane, but Gimlin says he doesn't really remember. Murray Field, outside EKA? ALL POST OFFICES WERE CLOSED, so it doesn't matter what the nit-picky semantic interpretation is of what Bob says are here. * They returned to the mountains and drove back to Louse Camp area after talking to Eureka newspaper, etc. * Gimlin returns to camp; full rain now; they barely escape the full creek and muddy flooded roads. "Leaving their horses tethered at their campsite, the two men started out in their truck for a local airport, probably Murray Field in Arcata. On their way, they stopped at Hodgson's store in Willow Creek to talk to their friend, Al Hodgson. As it was after 6:00 p.m., however, the store was closed. Patterson therefore telephoned Hodgson at his home. Hodgson and other friends, including Syl McCoy, thereupon met with Patterson and Gimlin, presumably at Hodgson's store." There is NO way they would take the Bald Hills to see Al H. FIRST! Now, MK, I've tested this basic outline, and it COULD be done. That is, if they didn't go over Bald Hills Road. I believe that one is just a mis-statement or misunderstanding between Patterson and Hodgson. I've tested that route (after all, I live in the area) after reading Daniel Perez' accounts, and found it to be impossible. Also, it is non-parsimonious. There is NO reason they would go that way. They weren't idiots. Patterson had been in the area before and knew the roads. It seems clear, too, that they were not rushing to a post office. Obviously, Roger must have known of a way to send a parcel by air to Washington. See? Take out inconsistencies which obviously cannot all be true, and the timeline makes complete sense. That is what Sherlock Holmes would do. What remains is the truth. You are probably right, being the expert on such things here, that there would have been difficulty in processing the specialized Kodachrome film that quickly. But then, Roger DID rent that camera earlier and took a bunch of footage up in Yakima for his documentary project. Perhaps, just maybe, he may have known someone in the Yakima-to-Seattle area who knew how to do the Kodak developing process? Not all patented methods are kept utterly secret, you know. Right? Anyway, I'd agree about one thing--it is a real mess, all of these recountings of the events. I can only say that perhaps it can be blamed on two basic things: human memory and story telling are not perfect, witnesses vary widely in their reports, stories change with the telling over time; also, perhaps they were just excited after filming the thing, and maybe didn't keep very good track of the timing of the thing (did they even wear watches? ), or mis-stated some things along the way out of pure adrenaline-fuelled distraction? I mean, how clear would your mind be if YOU were the one who'd just filmed a creature such as that, basically proving its existence (they'd have thought) for the first time? And, regarding that other film you spoke of in June--that is WELL KNOWN as coming from the late August to early September expedition that Rene Dahinden and John Green did. 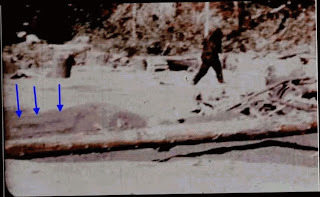 The earliest recounting of Patterson and Gimlin's presence in Bluff Creek before the filming places them there after they left Yakima on October 1st. They were in the Mt. 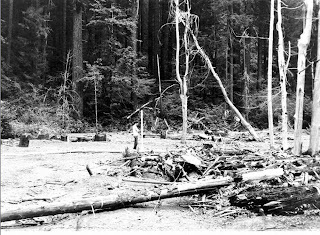 St. Helens area when the Blue Creek Mountain tracks were found. Roger found out about this from his wife upon returning to Yakima. 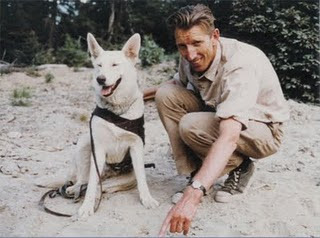 Meanwhile, Green and Dahinden had returned home to Canada, taking the white tracking dog with them. Titmus was up in Canada, and did not get to the film site until nine days later. Patterson and Gimlin prepared for another trip during September and didn't arrive until October (though the times of their arrival vary in the telling in the various books, we know they weren't there earlier). Dahinden was in San Francisco when the film was made, talking to the press about the Blue Creek Mountain tracks. So, unless you think ALL of those guys are life-long liars (and WHY would they lie? 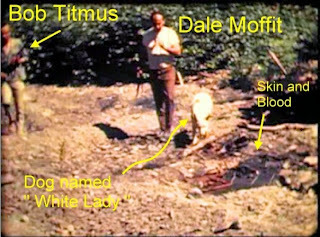 ), and that basically EVERY book and article and documentary ever written or made on Bigfoot is wrong, then Green, Titmus and Dahinden were NOT in the same places at the same times as Patterson and Gimlin until the film's first showing, back in Yakima, WA, on Sunday the 22nd of October, 1967. I hope we can talk about some of these things, and that I'm not alienating you by bringing them up. I still have a bunch of questions on the film site, its location, your work on the Redwoods film, your thoughts on the Freeman and other footage, and surely many more things that could come up. I hope you can hang in here with me, and have the time to respond. Images: Above, the cover of ARGOSY Feb. 1968; following, historical Bigfooters:John Green with White Lady on Blue Creek Mountain; Bob Gimlin and Roger Patterson with their tracks; the Lyle Laverty photo from the PG film site; Bob Titmus with his casts; Roger Patterson Bigfoot drawing from his book; one of the Blue Creek Mountain footprints; Rene Dahinden with the Willow Creek statue. Below, yours truly at middle just downstream from the film site on Bluff Creek, taken by Brad Pennock (see link below). MK DAVIS: There is currently an independent party, or parties that are going to consider the film, based upon some of my findings. This is not someone that I'm familiar with. It was arranged for by a third party. I feel that this should be completed first. You have asked some very good questions, and I will answer some of them here, but I may not all of them due to the aforementioned investigation. I'll respond tomorrow, if you don't mind, I'll have some time then. BIGFOOT BOOKS: Is this third party associated with NABS and Paulides? That's another thing I want to ask you about as, recently, Dave was talking about some of your earlier theories as if he'd discovered them independently, in a film and materials he got from the Ray Crowe archives. MK DAVIS: Hey Steve. I thank you for your inquiries. From this point on, I don't think that it would be prudent for me to publicly discuss any more. This should move outside the Bigfoot arena where it belongs. I would like to say before closing, and I say this emphatically...I did not utter in any way, the word "massacre". That did not come from me AT ALL. The conference in Ohio was duly recorded and is available. I encourage anyone to get a copy and listen for themselves. At the private gathering later that night, I discussed possiblities, with some seasoned researchers, which I almost always try and do. I learn a lot that way. No one is required to agree with me. I did not say that word there either. It was coined by people that were not in attendance and these same ones continue to fan the flames. Thanks for everything. M.K. BIGFOOT BOOKS: OK, MK, I understand. I suppose this stuff is all just too hot to touch these days. If you have any further comments on the other things I raised do let me know. I'm publishing what we have now for my more-or-less weekly posting. I can add any last words you might wish to add. We could always do a Part Three which I'd promise would have nothing to do with any "Massacre" issues. I'm told that Henry May was the one who came up with that term. I'd been advised by others not to call it that with you, but heck, I don't know what else to call it, really. It's a strange theory, in my opinion, but I guess anything could be possible. I mean, we are talking about Bigfoot here. Thanks for your time--I know it is in short supply these days. Image at left: An example of the stuff that MKD sent to the author of this blog back in June. 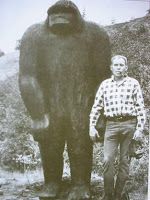 Here the image is borrowed from Bigfootsightings.org. Make of it what you like. I don't see blood, I see mud. Me say last week what me what say this one. All week same to me, Bigfoot no care but if it cold or hot. Go see last blog. Me still mad at NABS Dave. He still think he more cool than me, not answer any email. He wrong, just because he wear cop sunglass and mustache. Me fur all over. Me no need shades to be cool, hu-man. Me dump him from my fACEbOOK page. No want police snoop on my life. He He He! Ha! OTHER FILM SITE PHOTOS. These were taken in the years shortly following 1967. The first is by John Green, featuring Jim McClarin, the second is by Peter Byrne, and the third is by Rene Dahinden. They show, at least, that the actual location of the site was (and is) WELL KNOWN. Images, historical--sourced from the Munns Report site (see link below). As always, CLICK TO ENLARGE. If you are wondering what MK and I are talking about here the basic answers can easily be found through the links below, or in our previous part of the interview. Check it out. The Truth Is Out There! 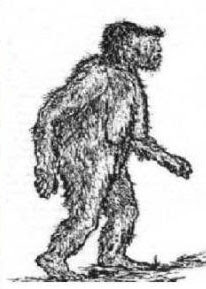 Christopher Murphy's History of the PGF HERE on Bigfoot Encounters. MK Davis PGF stabilization links found on Bigfoot Encounters. These are animations showing details not available in this blog. THE MUNNS REPORT is a great study of the film using professional and reliable optics done by Bill Munns. It's also a great resource for its digital film site modeling. Look around in the Table of Contents and Index. 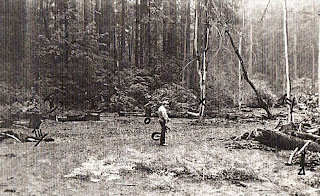 Bigfoot Encounters has a great page on the REDWOODS FILM, mentioned by MK above. Blogtalk Radio show THE GREY AREA had researcher Bill Miller on, talking about the theories of MK Davis. For a critical view on the "Bigfoot Massacre" theory listen HERE. LARRY BATTSON'S WILD on Blogtalk had a very interesting show with both JOHN GREEN and BOB GIMLIN interviewed regarding certain current controversies regarding the PGF. LISTEN ONLINE HERE. 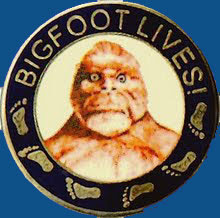 BIGFOOT BUSTERS show on BlogTalkRadio, featuring MK Davis Interviewed on Dec. 11, 2009. SQUATCHOPEDIA's Patterson-Gimlin Film Timeline of Key Events. BELIEVE IT TOUR's page for their PATTERSON-GIMLIN FILM SITE PANORAMA image. Actually, that is me in the image, but I think the actual film site starts upstream just a tiny bit from where the photo was taken. 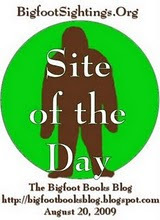 Text contents of the blog are copyright Steven Streufert, Bigfoot Books, 2009, save where otherwise credited or quoted. MK's words are his own. Please notify us for permission, but quote freely with citation, and post a link to this blog on your site if you'd be so kind.